Mohawk Airlines was an airline that operated in the Mid-Atlantic region of the United States, primarily the states of New York and Pennsylvania from the mid-1940s until its acquisition by Allegheny Airlines in 1972. At its height, it employed over 2,200 personnel and pioneered several technical and social aspects of regional airline operations, including being the first airline in the United States to hire an African American flight attendant. In 1958 Mohawk moved its headquarters from Ithaca to Oneida County Airport in the Town of Whitestown, New York, near Utica. The airline began operations in 1945 as Robinson Airlines out of Ithaca Municipal Airport near Ithaca, New York, flying single engined, three passenger Fairchild F-24 aircraft. As it grew in the 1950s, the Douglas DC-3 became its primary aircraft; the Convair CV-240, CV-440s and Martin 4-0-4s were integrated into its fleet later. The airline also experimented with helicopter service between New York and Catskill Mountains resorts with limited success. In 1952 Robinson was purchased by Robert Peach, and the name was changed to Mohawk Airlines as the result of a customer contest. In 1958, the airline moved its headquarters to Utica, NY, in the heart of the Mohawk Valley. On February 11, 1958, Ruth Carol Taylor was hired by Mohawk Airlines, becoming the first African-American flight attendant in the United States. Only six months after breaking one historic barrier, Taylor's career ended due to another discriminatory barrier: the airline's marriage ban, a common practice among airlines of the day of dismissing flight attendants who became either married or pregnant. In 1961, it became the first airline to use a centralized computer-based reservation service. And in 1965, it became the first regional airline to utilize flight simulators. 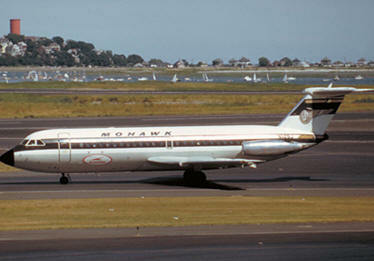 Mohawk also upgraded its fleet with the British Aircraft Corporation BAC 1-11 in 1965, becoming the first regional airline to inaugurate jet aircraft service. By 1969, all piston-engined aircraft had been retired from its fleet and Mohawk flew mainly BAC 1-11 and Fairchild Hiller FH-227 aircraft. By 1971, labor issues and several strikes caused Mohawk to enter merger discussions with Allegheny Airlines, and the merger was completed in 1972. The resulting company eventually became USAir in 1979, changing its name to US Airways in the late 1990s. US Airways was acquired by America West Airlines, but the Arizona based parent company of America West chose to maintain the nationally more recognized name and branding of US Airways.